Over 12,000 helicopters were used in the Vietnam War, which is why it became known as "The Helicopter War". Almost half of the helicopters, 5,086, were lost. Helicopter pilots and crews accounted for nearly 10 percent of all the US casualties suffered in Vietnam, with nearly 5,000 killed and an untold number of wounded. Lew Jennings flew over 700 Air Cavalry Cobra Gunship Helicopter missions and received three Distinguished Flying Crosses for Valor. This memoir describes first-hand the harrowing experiences of helicopter pilots and crews in combat operations, from the far South to the DMZ, including the infamous Ashau Valley, Hamburger Hill, LZ Airborne, and others. 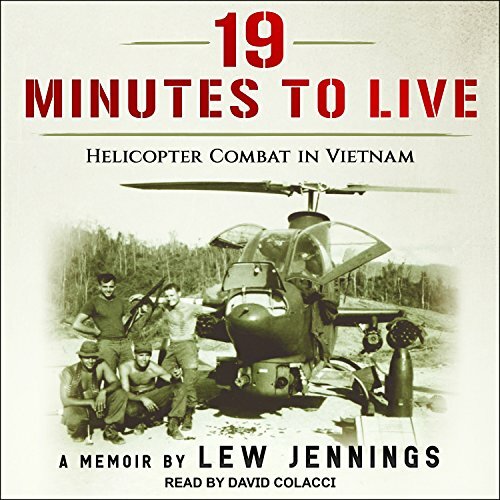 19 Minutes to Live illustrates the incredible courage and determination of helicopter pilots and crews supporting those heroes that carried a rucksack and a rifle in Vietnam.